This under-window bookcase is a terrific project for woodworkers of all abilities. Building it employs many of the same techniques used when building cabinets, but adds a number of trim moldings to improve its appearance. The project also requires a level of precision that will greatly enhance the woodworker's skill level. You can make the bookcase out of any type of wood you choose, but the most popular choices are oak or pine. 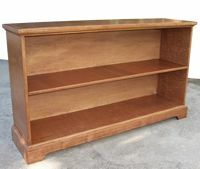 The bookcase displayed in the pictures on the following pages was made using birch plywood with pine molding and is ideal for finishing with paint. Download the to build this bookcase (PDF). The first step to building this bookshelf is to cut the two shelf standards--the vertical pieces that form the sides of the bookshelf. Using a radial arm saw, table saw or circular saw, cut two pieces of 3/4" plywood 12" wide x 28 1/4" high. Set these two pieces aside for the moment. Next, you'll need to cut the three shelves. The top and bottom shelves are cut to 12" x 47", and the center shelf will is cut to 11 3/4" x 47". Finally, cut one piece to 12" x 48". This will be the top of the unit. Set this piece aside for the time being, as you won't need it until step 5. Now that you have the shelves and standards cut to size, you'll need to cut the dadoes and rabbets to accommodate the shelves and the plywood back. Install a stacked dado blade set on your table saw or radial arm saw, adjusted to a 1/4" thickness--this should mean you'll use the two outside blades only, with no interior chippers. Set the depth of cut to 3/8" and your fence to 11 3/4". Cut one rabbet on each of the two shelf standards, along one of the 28 1/4-inch edges. Also cut a rabbet on the top shelf and the bottom shelf in the same manner, along one of the 47-inch edges. When the rabbits are completed, you'll need to re-set the stacked dado set to 23/32" in thickness. This should require three 1/8" chippers, one 1/16" chipper and two spacers (in addition to the inside and outside blades). See the instructions that came with your stacked dado blade set for the exact setup required. Set the depth of cut to 1/4". On a work table, lay the two shelf standards with the rabbits facing up and the rabbeted edges lined up together. This will ensure that the standard on the left will remain on the left, and vice versa with the standard on the right. On each standard, make a mark 4 1/4" up from the bottom and another mark 16 1/4" up from the bottom. Use your square to mark a cut line at each of the marks, perpendicular to the rabbits. These marks denote the tops of the dado cuts. Use your radial arm saw or table saw with the dado set properly installed to cut the 1/4"-deep dadoes at the marked lines. If using a table saw, use a miter gauge to guide the cut--do not use the fence, as the stock can bind against the fence. Finally, you'll need to make one more rabbit in each standard. This rabbit will be at the very top of the standard, using the same setup, and will accommodate the top shelf. Line up the top edge of the standard with the edge of the dado set to make the cut. Once you have completed cutting the dadoes and rabbets in the shelves and standards, it's time for some assembly. Using a large work table or another flat surface, place a small bead of woodworking glue in the center dado of the right shelf standard. Then, insert the center shelf into the standard, making certain that the shelf is properly seated and is flush with the front side of the standard (opposite the rabbit). Tip the unit over so that the fronts of the two pieces are on the table. Drive two or three finish nails through the standard into the shelf, taking care not to mar the wood with the hammer. Use a nail set to finish driving the nails. Optional: If you have a pneumatic brad nailer, you can alternatively insert some brands diagonally from the bottom of the shelf into the standard. This is preferable, as the nails will hold a bit better and will be less visible in the finished bookcase. Using your table saw or circular saw, cut the 1/4" plywood to 47 1/4" x 24". With the assembled case still face down on the table, check the unit for square. Using your tape measure, determine the distance across the back of the unit from the top-left corner to the bottom-right corner (this measurement should be somewhere in the neighborhood of 55 5/8"). Make a note of the exact distance, and then measure the distance between the opposite two corners. The two measurements should match. If they don't, the unit is out of square and needs to be adjusted. Simply move the case by pushing against the side of the case on one of the two longer corners, and then measure again. Repeat until the unit is square. Now that the case is square, place the plywood back into the four rabbits. It should fit snugly, with the surface flush with the back of the case. Re-check the case for square, and then attach the plywood back with finish nails (no glue). Now that the basic case is completed, we'll add some decorative touches to the case, beginning with the base of the unit. You'll be making a couple of curved cuts using either a jigsaw or band saw. Cut one piece of 1x4 to 50" in length. This is slightly longer than the final length, but it will be trimmed to fit when installed. Make a mark 4" in from each end of the board. Then, make a mark 1 1/2" in on each of these two marks. Using a straightedge, connect these two most recent marks. Now, using either a compass or circle template, scribe a 1 1/2"-radius arc connecting each of the first two marks and the straightedge mark, as shown in the PDF version of the plans (downloaded in Step 1). Cut along the arcs and straight line using a jigsaw or band saw. Clean up the saw cuts using sandpaper. Center this board on the front base of the cabinet, and mark the edges of the cabinet on the board with your pencil. Mater, a 45° angle cut on each end, using a miter saw. Cut a length of 1x4, miter-cut on the front and square-cut on the back, to fit on each side of the case, matching with the miter on the front piece. Once all pieces fit properly, attach the three pieces to the bookcase with finish nails. Now we'll attach the quarter-round and cove moldings, which will give the case a nice, detailed profile. Using the same procedure that was used to meter and attach the baseboards, measure, and miter a piece of quarter-round molding to attach to the front top edge of the bookcase. Cut shorter pieces, miter-cut on the front and square-cut on the back, for each side. Keep in mind that one flat face of the molding will fit against the top of the bookcase, while the other flat face will be on the side. Attach the three pieces of quarter-round molding with finish nails. Next, cut a piece of cove molding to fit directly underneath the front piece of quarter-round, as well as a piece for each side, cut in exactly the same manner as the quarter-round molding. This cove molding should fit up underneath the quarter-round molding. Attach with finish nails. Repeat the procedure with the cove molding for the bottom of the unit, fitting directly on top of the 1x4 baseboard pieces. This cove molding will dress up the tops of the 1x4s on the front and two sides. Again, attach with finish nails. Finally, we're going to cover the exposed front edges of the two standards and the center shelf. Cut one length of screen mold to cover the front of each standard and attach with finish nails. When both standards are covered, cut one length of screen mold to cover the center shelf, butting up against the other two pieces of screen mold. Attach this piece with finish nails as well. Check all finish nails on the entire unit and set all nails with a nail set. Now that the woodworking is completed and all nails are set, move on to sanding. Begin by sanding the entire unit with 100-grit sandpaper, followed by 150-grit and finally 220-grit. Wipe down the unit with a clean cloth. Then, use a putty knife to fill each nail and screw hole with a stainable wood filler. Pack the filler tightly into each hole, leaving a bit of excess outside of the hole to allow for shrinkage. Once the filler has dried completely, sand it flushes. TIP: Be certain to sand enough to remove any filler that may have seeped into the wood around the hole, as this will show a discoloration if you choose to stain the piece. If any holes need to be refilled due to shrinkage, fill, wait for it to dry and sand again. When the bookshelf is thoroughly sanded and the holes have been filled and sanded, wipe down the entire unit with a clean, dry cloth. Use a couple of tack cloths to get any loose sawdust off of the bookcase. If you choose to stain the unit, apply a coat of stain to all surfaces of the bookcase, following the instructions that come with the stain, using a soft cloth and rubbing the wood parallel to the direction of the wood grain. After the required time, wipe off any excess. If a second coat of stain is needed to achieve the desired color, apply it once the first coat has dried. When the stain is dry, wipe down the bookcase and apply a thin coat of polyurethane, again brushing with the grain. When the first coat of polyurethane has dried, lightly sand all surfaces with 220-grit sandpaper. Then wipe down the entire bookshelf and apply a second light coat. Repeat the steps if a third coat is desired. If the paint is your chosen finish, apply a single coat of primer, brushing with the grain, as per the instructions on the can. Then, when the primer is dry, apply two individual coats of paint. 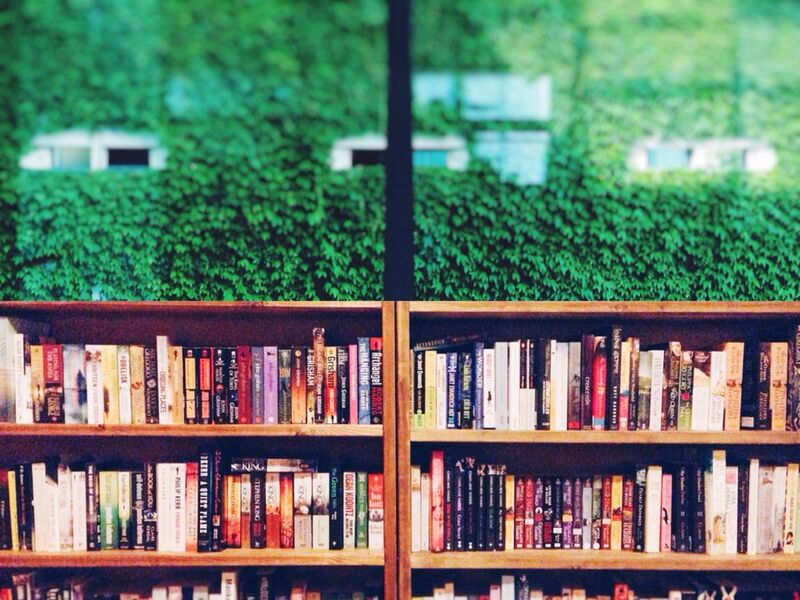 Your bookcase is now completed. You should have a beautiful, heirloom piece of furniture that you will be proud to display.